You'll love the BBC's Life Story episode "The Hummingbird Fight Club" featuring RLG's Booted Racket-tails in slow-motion 4K HD! 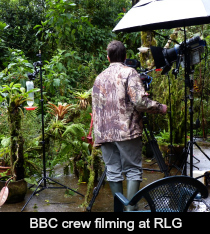 Back in March of 2012, a crew of three filmmakers from the Natural History Unit of the British Broadcasting Corporation (BBC) arrived at RLG to film hummingbirds. They arrived with 40+ pelican cases of equipment, including an amazing high-speed video camera. 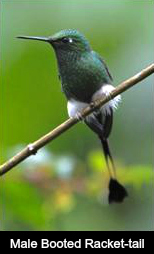 The producer, Tom Hugh-Jones, had contacted me weeks earlier to see if we could offer them the type of conditions they required for filming, including comfortable lodging with permanently available electricity, transportation, and meals along with a forest and guaranteed hummingbirds, especially the Booted Racket-tail. I said yes to all. Setting up shop in one of our guest houses, the crew proceeded to film pretty much constantly for 20 days. I was truly impressed with the creativity, dedication, team-work and professionalism the entire crew displayed. Often the cinematographer did not even eat, and I later learned he is considered one of the world’s best wildlife cinematographers. Most nights the crew showed us some footage of what they had filmed during the day using new 4K ultra high definition technology, which as one HD reviewer notes, is "more immersive and detailed than regular 1080p HDTV, because it has four times the pixel resolution. As such, the images are far more vivid and intense." 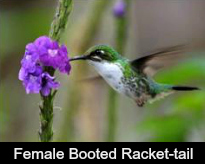 The camera crew was able to capture astounding footage of Booted Racket-tails out-maneuvering larger hummingbirds for food. Even more impressive, they captured an incredibly detailed duel between two Booted Racket-tails as they fought over territory. This past October 2014, the film was aired by the BBC in a series entitled Life Story narrated by Sir David Attenborough. The specific footage filmed at RLG is in “Episode 2: The Hummingbird Fight Club." Most of the clip was filmed on our back patio and though short, the video is stunning and well worth checking out--click here to link to it on the LGF website. The entire episode is filmed in slow-motion 4K ultra HD, giving you a wild ride into the world of hummers. LGF is pleased to announce that our supporters can now donate through PayPal.The orange "donate" button on our website links you to PayPal where you are given the option to don ate through your personal PayPal account if you have one OR via credit card. All major cards are accepted. Both JustGive and PayPal offer a comment box where you can specify how your dollars are to be spent. If no comment is included, the donation goes into LGF's general fund. 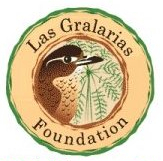 Remember, LGF is a volunteer-based organization and our board members absorb all "overhead" costs, meaning all dollars donated will be used to conserve the amazing cloud forest habitat! Since beginning our Matching Donation Fund in December, a fund which actually triples our donations, we have received $3,170 from our supporters! This means we now have $9,510 added to the existing Habitat Acquisition Fund. We have until this year's Earth Day--that's April 22, 2015--to raise the remaining $16,830 to reach the $60,000 goal needed to purchase another parcel of critical habitat in the Santa Rosa River watershed. Please help us spread the word about preserving an amazing area of cloud forest by forwarding this Chirp to anyone you think might be interested in helping out. According to the International Union for Conservation of Nature, Ecuador is home to 671 endangered and 248 critically endangered plant species (IUCN 2014). Many of these are Andean species with restricted habitat patches and small population sizes. Some endangered species may be found at Reserva Las Gralarias, including Nasa aequatoriana, a small, herbaceous, and highly endangered plant. Twenty years ago, less than half of all Nasa species were known to science; today, 100 species are described (Henning 2012). Nasa aequatoriana has been collected 13 times, and only 6 populations have been documented (IUCN 2014), but this is partly because South American flora are so understudied and under-collected. Nasa aequatoriana is well known by locals near Las Gralarias who call the plant “Ortiga.” Ortiga, a word generally referring to a stinging plant (equivalent to the English "nettle"), is sometimes applied to other species, especially those in genus Urtica (Urticaceae). This “negative” stinging quality, which is caused by hair-like setae and trichomes, is obscured by a beautiful and interestingly arranged flower. 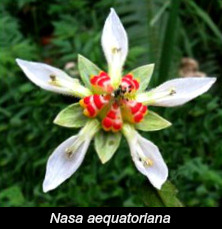 Nasa flowers are called tilt-revolver flowers and have petals that are shaped like boats (Henning 2012). The stamens move from within the white petals to an erect center position (see photo). Pollinators may trigger the stamen movement by consuming nectar near the middle of the flower, which they do by first bending the red nectar scales, ultimately sending the stamens flying up (Henning 2012). The moving anther dusts the pollinator with a smattering of pollen, and the insects/hummingbirds are then ready to pollinate other Nasa individuals. This kind of stamen movement is called thigmonasty, and it is an amazing example of plant-pollinator evolution. Look for Nasa aequatoriana on hikes near the campground site, or also in other areas that are disturbed or have secondary forests. It is usually found in undergrowth but can climb as well. There is certainly an ineffable quality or value in all living things, even those that sting passers-by, and the preservation and continuation of these species is of utmost importance as habitat is lost and the climate rapidly changes. We owe our thanks to RLG for continuing to see this preservation through. Henning, T. 2012. Systematics and floral ecology of Nasa (Loasaceae subfam. Loasoidea) and its allies. Dissertation. Freie Universität Berlin. Cornejo, X., Suin, L. & Pitman, N. 2004. Nasa aequatoriana. The IUCN Red List of Threatened Species. Version 2014.3. <www.iucnredlist.org>. Downloaded on 16 December 2014. The IUCN Red List of Threatened Species. Version 2014.3. <www.iucnredlist.org>. Downloaded on 16 December 2014.